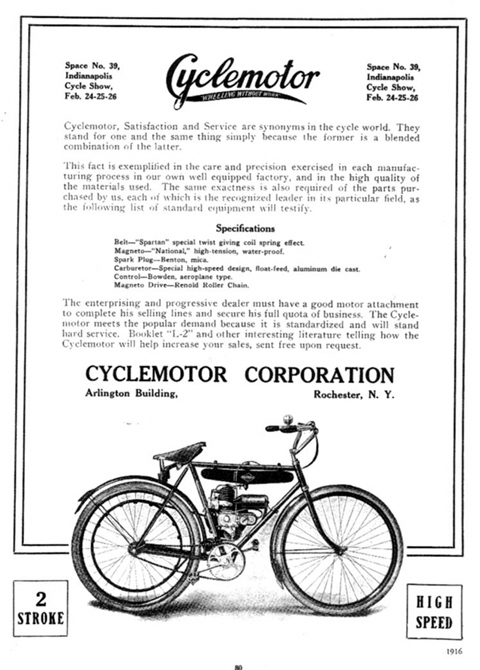 The Evans Cyclemotor is an American machine, that was popular in France in the first few years of the 1920s. This example has an extremely rare (original) frame style, made only for the French market. A pair of sectioned Cyclemotor engines were on display at the 1922 Paris Salon (above). On 13 October 1921 an Evans had set the world speed record for an under-100cc machine with an average speed of 54kph along the allée des Acacias in the Bois du Boulogne. The record-breaking machine is recorded as having a capacity of 91cc. This must have been a sleeved-down version of the normal engine, since the usual capacity of a Cyclemotor is 119cc. The Evans Cyclemotor was imported to France by two concerns: Géo Dupuy of 31 rue Poussin in the 16th arrondissement of Paris, and Coren & David in Orange, Vaucluse. It competed with a variety of similar French models. But publicity from its world speed record and its promotion in the French motorcycling press gave it an edge for a while over the local talent. The version presented here is a very rare ‘Modèle Luxe Ecclésiastique’ with a step-through frame for members of the clergy to ride while wearing their cassocks. Such frame variations suggest a considerable investment by the American manufacturers Cyclemotor Corporation and the French importers. 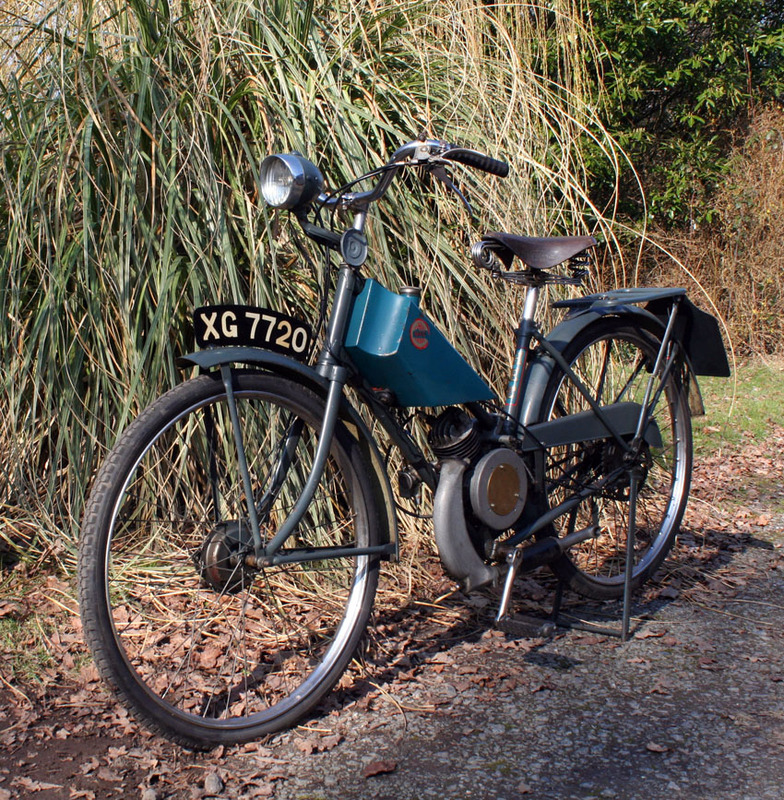 This Evans PowerCycle was found in a French barn, where it had been stored since the 1950s. The owner’s grandfather bought it for his wife (the seller’s grandmother) to use. She mostly rode it around their estate. When she stopped riding it, the grandfather put it inside the barn, where it remained until 2013. When I got it, the tyres had perished, so we fitted it with new 26 x 2 x 1 3/4 tyres. My mechanic freed the cables, and stripped, examined and cleaned the engine. He remarked that the piston is unusual, having a ring on the bottom and a triple ring on top. The engine is in surprisingly good condition, showing little use. 1. Carburettor float is missing. (A friend has a complete carb, so I will buy that). 2. No spark. So the magneto will need servicing. 3. Left-hand handlebar grip is a twist-grip for the advance-retard. It needs a new inner (piano wire) cable. It works one way, but not the other (ie it is ‘push and pull’). 4. The magneto probably needs a new morse chain. The current one has been cleaned and is functional, but once the bike is running it’s better to replace it. 5. The rubber belt on it in the photos is just for display. I have now purchased a correct 13mm belt for it. 6. It needs a petrol tap fitted inthe bottom of the petrol tank. 7. I had intended removing the front brake, as it’s missing the brake rubbers and holders at the bottom. However the linkeage is unique and an interesting feature, so I’ve left it in place. Bicycle rubbers can be adapted to fit. 8. The horn is missing. I have left the original horn-fitment on the handlebar because it is also a unique part. 9. The lights have only their outer shells. 10. The pedals need rebuilding. All these parts are easy to find, and the jobs are straightforward to do. I will sell the bike as is, for the purchaser to finish the restoration; or do it myself by arrangement with the purchaser, if preferred. The metalwork is sound, with no rust holes. The original transfers are intact and readable. This is a unique one-owner (before me) machine. Ecclesiastique models are rare and sought-after. The best aspect is that no amateur ‘restorer’ has previously got his hands on it and ruined it! So it is a ‘virgin’ barn find that’s ready for a serious motorcycle enthusiast to own, cherish and put on the road. 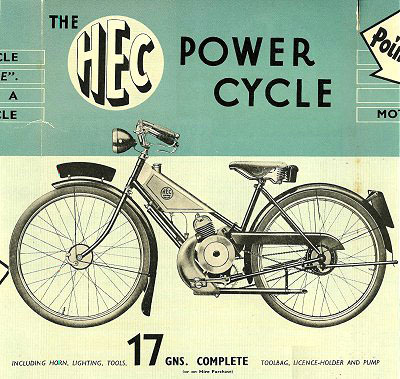 The ‘Power Cycle’ name was used again for a small motorcycle in 1939, by Levis and Hepburnn Engineering Co (H.E.C). It was only manufactured for one year, as the company’s Birminghamm factory was bombed on 3rd May, 1940, ending production.